A little brother to our 60w LED plant lamp. Just like our 60 watt flood lamp this lamp is completely silent and cools itself with silicone gel through its roubust metal shell. With 30 watts, it uses less energy, but is still very effective and excellent for your plants and cultivation requirements. Unlike other LED plant lighting that often have an uncomfortable light with dominant red colors, this lamp can easily be placed in for example a living room or another open area without being perceived as hard on the eyes. The red blue and green wavelengths have all been optimized for various plant pigments and the combination is also the basis of white light which highlights all the colors of the plant. Gemma's lighting with 45 degree angle is enough for a surface area of about 1 square meter plant lighting while with 90 degree angle light is enough for about 3 square meters. There are two variations of 30 Watt plant lights depending on what you are going to use the lamp for. Either with 45 and 90 degree light angle, where 45 degrees is more suitable for cultivation and growing and where 90 degrees is better suited for plant maintenance and support because it covers a larger area. You can select 90 degree angle if you grow in a confined space where the enclosure inside reflects. This will result in a more even spread across the entire grow area. 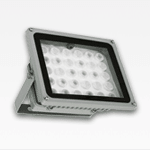 Is possible with our 30 watt, just as with our 60 watt plant lamp because it is IP65. 30 Watt (90°) is out of stock.